Photograph by R. H. Hensleigh and Tim Thayer. Raphael Soyer’s paintings and prints created during the Great Depression are among the most evocative representations of that period. In these works, Soyer, no stranger to poverty himself, shows his affinity with his subjects, who were often working-class men or the unemployed. Soyer based this lithograph on his painting How Long Since You Wrote to Mother? (private collection), in which he used homeless men he had met in the Bowery as models. 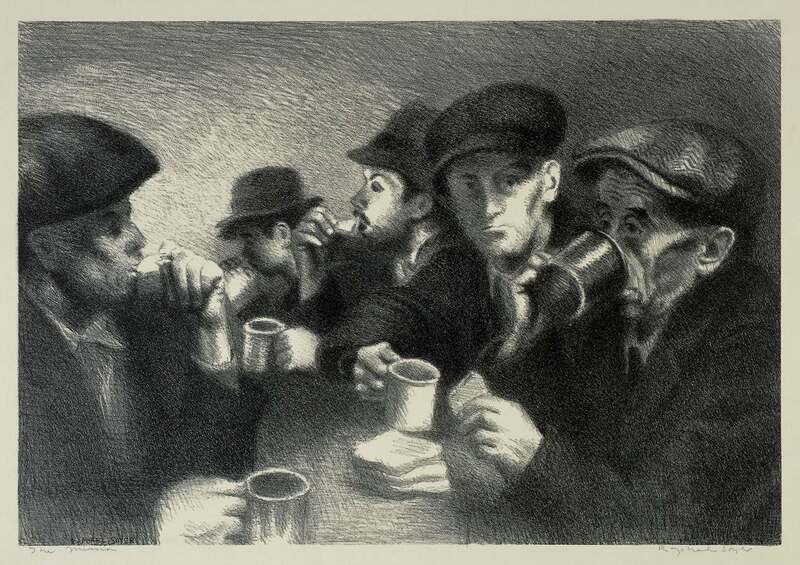 In portraying the transients in The Mission in attitudes ranging from resignation to defiance, Soyer also displays his skills as a lithographer. The rich darkness of the clothing of the men huddled around the table emphasizes the glowing highlights on their faces and hands, and on the tin cups of coffee and the bread they are consuming, possibly the only meal they will have that day. Soyer considered The Mission to be one of his most important lithographs.